There's an increasingly wide range of fish food products available to buy in pet shops and over the internet, but even then you won't always find what you want. Fish have varied appetites and tolerances, and the best thing for most of them is a varied diet, with different kinds of food on different days. Making your own food is a great way to care for them and learn more about them in the process. Protein - All fish need plenty of protein in their diet, and for carnivorous fish protein is the most important constituent of food. Although you can feed meat and fish directly, it's a bad idea to mix them into food for drying or freezing as there's too much risk of infection. You can use egg yolk and pulses (peas and beans) as alternative protein sources. 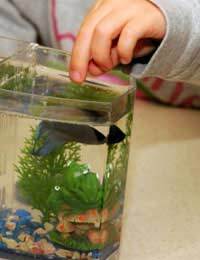 Carbohydrates - The amount of carbohydrate your fish need will vary depending on how active they are. If you feed too many carbohydrates to lazy fish, they'll put on weight and become unhealthy. Sugars should be avoided in favour of complex carbohydrates that release energy throughout the day. Cooked, ground rice, oats or barley are good sources of carbohydrates. Fats - Fish need fats to give them a reserve of energy during times of illness, and to help them produce the oils that protect their skin from infection, but, as with humans, too much fat can lead to ill health. The best sources of fat come from fish or from olive oil. Some aquarists use dried milk, but not all fish can break this down properly. Vitamins and minerals - It's vital for fish to have a regular source of vitamins and minerals because their bodies are generally too small to store much beyond what they immediately need. Banana and cucumber are great options for this, and you can also use fish oil, crumbled dried seaweed or spinach, and pulses. Fibre - Because fish have very short digestive tracts they can't process fibre very effectively, but eating it helps to flush their systems and keep them from developing gastrointestinal problems. Even carnivorous fish can benefit, especially if they suffer from bloating after eating. The best source of fibre is vegetation - algae, blanched lettuce or cabbage, broccoli or cauliflower. Salt - Fish get the balance of salts they need from the water they live in. Some salt also comes from food, but if you are preparing otherwise healthy food to meet the requirements described above, you shouldn't need to add any extra. Too much salt can very quickly lead to health problems. Individual fish, just like humans, can suffer from allergies and intolerances. Often making your own fish food is the best solution to this, as it means you can adjust your recipe to suit their needs. Gluten intolerance is increasingly common among fish bred for the aquarium trade. It often manifests as bloating after eating carbohydrate-rich foods. Affected fish may have difficulty controlling their position in the water. If this is a problem, use fruit-based instead of cereal-based carbohydrates. Squash, pumpkin, avocado or apple can provide for their needs and will be easier to break down. If your fish seem to suffer allergic reactions to food, the best way to work out what's wrong is to cut out one ingredient at a time and see how they respond after each meal. Some fish have problems not because of the food they eat but because of how they eat it. They may gulp too much air when feeding from the surface. If you suspect this is happening, try making their food into hard pellets that sink before they are eaten. The best approach to making your own fish food is to choose one or two ingredients from each of the categories recommended above and mash them together in a bowl, making sure they're thoroughly mixed (you'll need to shred leaves first). You can beat the mixture out into a flat sheet so that it can be shredded to make flakes or small pieces can be pinched off and rolled into pellets. Food prepared like this can be stored in your freezer. Make sure you break it up first so you don't need to thaw the rest to get what you need. It's a good idea to make three or four different food mixtures to feed on different days. This will make sure you fish stay excited about their food, and they'll soon let you know what they like best.